If you’re looking for a fun activity to teach your young elementary kids (ages 4-8) about prayer, then look no further than your hand. The hand is a perfect tool to remember the parts of prayer that we see Jesus model in the Lord’s Prayer in Matthew 6:5-14. All you need for this activity is blank paper, pencils or markers, a Bible and little hands. Jesus is teaching the disciples that prayer is about conversing with God, or building a relationship with Him. In this model prayer (or the Lord’s prayer as it is sometimes called), Jesus calls His followers to praise God, to confess sin, to ask for forgiveness and to pray for the needs of themselves and others. Hand out the blank paper and help them trace their (non-dominant) hand on the paper with their fingers spread apart. Explain to the kids that they’re going to use their hand as a reminder of how to pray. Once they’ve all traced their hands, have them write the following words on each of the fingers and then go through the discussion about what that kind of prayer is. Have kids help you come up with examples of what you could pray about for each of these types of prayer. 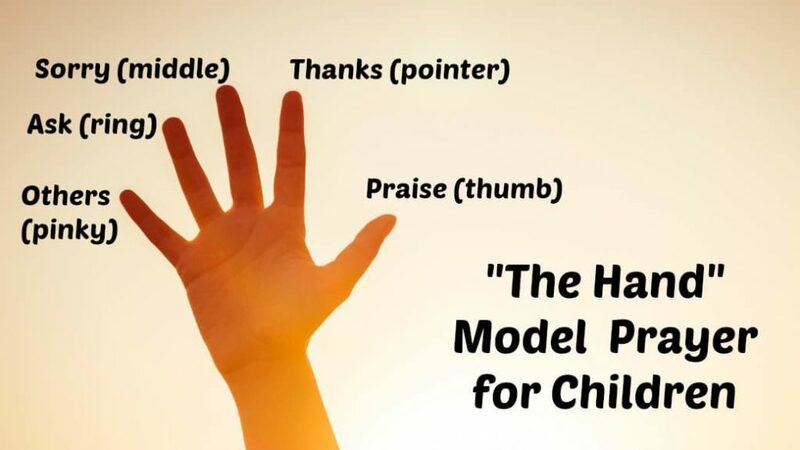 Kids may want to draw their examples on (or around) their hands as reminders of what each part of the prayer is. PRAISE (thumb)– – Praise is telling God how great He is and talking about all the great things that God has done. 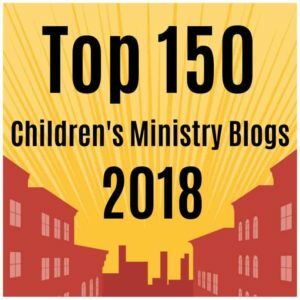 Ask kids, ‘What are some things that you could say to God to tell Him how great He is?’ If you think time will allow, make an alphabetical list with one truth about God for each letter of the alphabet. THANKS (1st finger)– – Thanksgiving is about thanking God for the things He has done and the things He has given us. Ask, ‘What are you thankful for?’ Help kids think of things in their lives, their families, the Bible, etc. that they can thank God for. ~ REPENT ~ turning away from your sin and turning to God. (you can illustrate this by writing God on one piece of paper and sin/ self on a 2nd piece of paper and putting them on opposite walls. Have all the kids walk toward the sin sign while you talk about sin, then say repent and have them turn their back on ‘sin’ and walk toward God. Ask if they can be walking toward both at the same time….can you be sinning and obeying God at the same time? ASK (ring finger)– -Ask is asking God for the things that you need. This is the time to ask for things you need, not just things you want. Ask kids, ‘What’s the difference between a need and want? What are some of the things we need?’ Remind kids that one thing we all need is a Savior and that Jesus is the only way to be saved and the only way to have a relationship with God. Take a minute to remind kids of Acts 4:12 which reminds us that salvation is only by believing that Jesus died on the cross and paid the price for our sin. OTHERS (PINKY)– -Intercession is a word we use when we pray for others and it means asking God to help other people. You can pray for your family, your friends, people in your church and other people who need to hear about Jesus. Ask kids, ‘Who are some of the people you could pray for?’ Make a list of people to pray for and spend a few minutes praying for them. For non-readers – the key words should be written on a piece of paper so that they can copy them onto their hands. Or you can write the words for them. others– pray for those who haven’t heard the good news that they would have a chance to hear about Jesus. Thank You , So much for this lesson and activity in Prayer. How to use it in showing the young one what it Truly means to have that One on One Time with Our Lord Jesus. Not only that this activity is very helpful the young ones ,but also for the teens and adults to have that simple understanding of Prayer. Tony Kummer (Editor) reviewed & updated this page on : March 26, 2019 at 10:28 am. All our content is peer reviewed by our readers, simply leave a comment on any post suggest an update.